A higher minimum wage, immigration reform and public-private partnerships to boost job growth. If Tuesday's State of the Union address to Congress had a familiar ring to it, it's because the list of initiatives President Obama proposed was little changed from last year's speech. In a reprise of his central theme a year ago that government needs to do more to restore the "notion that if you work hard and take responsibility, you can get ahead," the president outlined a series of proposals to help those stuck at the bottom end of the economic ladder. President Barack Obama delivers his State of the Union speech before a joint session of Congress on Feb. 12, 2013, in Washington. "Even before the Great Recession hit, massive shifts in technology and global competition had eliminated a lot of good, middle-class jobs, and weakened the economic foundations that families depend on," the president said. But despite a steadfast commitment to help those families, the administration has made halting progress in the past 12 months. While the jobless rate has fallen gradually since the recession ended more than four year ago, total employment has not yet returned to pre-recession levels. Millions of Americans have simply given up looking for a job and are no longer counted as unemployed; the share of the population officially counted in the labor force has fallen to levels not seen since the late 1970s. Though wage growth has perked up a bit this year, it has been stalled for much of the economic recovery. The average length of unemployment for those out of work stands at 37 weeks, more than twice as long as any recovery in a half century. Obama also renewed calls for Congress to pass sweeping immigration reform and to increase access to early childhood education programs – both ideas first proposed in last year's State of the Union address. Republicans have warmed to the idea of incremental changes to immigration law. But with little legislative support for the wider initiatives spelled out Tuesday night, the president is likely to continue to tread water on his economic agenda until at least the midterm elections in November. "He can't do big infrastructure investment, and the big changes to immigration have to go to Congress," said Gus Faucher, a senior economist at PNC Financial. "Given what the president is facing with Congress, by definition all of the things he going to be able to do by executive order are small bore." Frustrated by inaction on Capitol Hill, Obama Tuesday promised to issue an execute order boosting the lowest wage for federal contractors to $10.10 an hour, in hopes that Congress will follow his lead and boost the base wage for all workers. At $7.25 an hour, the federally mandated minimum is well below its 1968 peak of $10.71 an hour when adjusted for inflation. "America does not stand still - and neither will I," the president said. "So wherever and whenever I can take steps without legislation to expand opportunity for more American families, that's what I'm going to do." If Congress fails to follow his lead, the measure would provide wage relief for only several hundred thousand workers. To help those who have been out of work the longest, Obama pressed business leaders to promise not to discriminate against long-term unemployed Americans. While such an initiative might reduce the average duration of unemployment, it would likely do little to boost the overall pool of new jobs growth, said Faucher. "Presumably if they're doing that, they're not going to hire the short-term unemployed," he said. 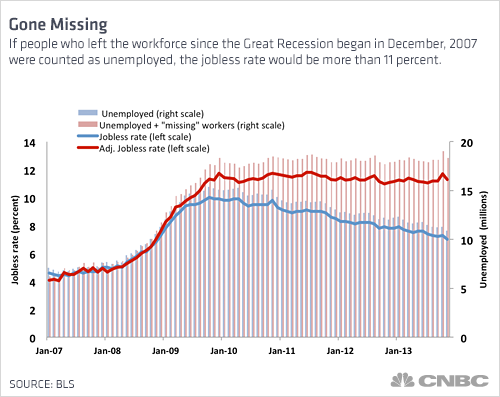 "So on net it's unclear whether that adds much overall to job growth and economic growth."